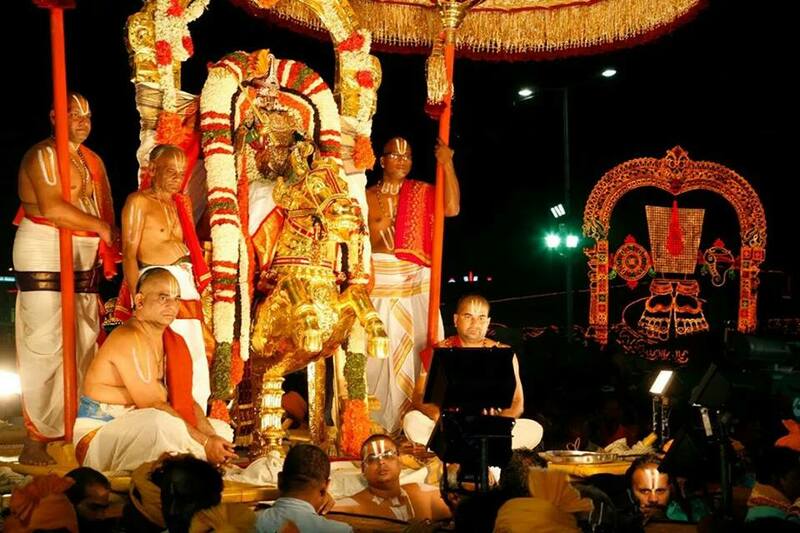 After successfully completing it’s 2014 edition,the annual Tirumala Brahmotsavams – that began on the holy Tirumala hills on Friday the 26th of September,2014 – came to a conclusion on Saturday the 4th of October,2014.. 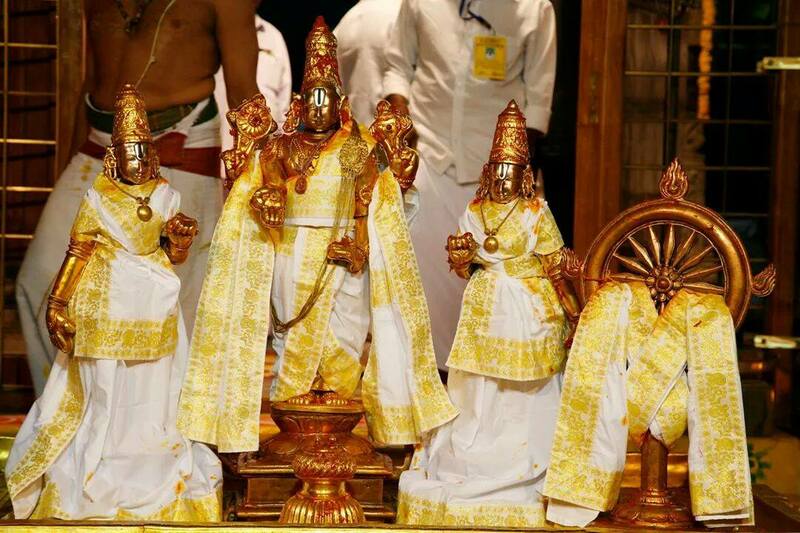 Literally called the Salakatla Brahmotsavams,these Tirumala Brahmotsavams are performed every year over a period of nine days in the Tamil month of Purattasi that also heralds the beginning 0f Navarathri/Dasara festival.. 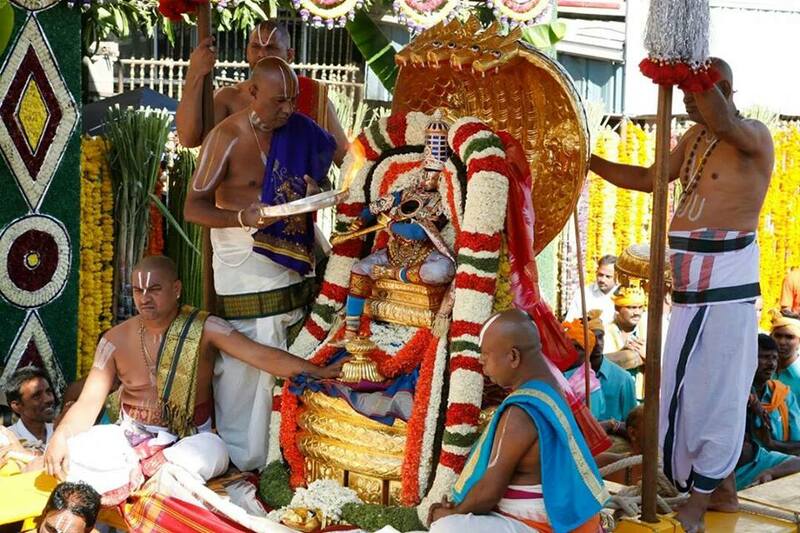 This procedure called DHWAJAROHANAM, is performed on the first of day of Tirumala Brahmotsavams and it heralds the beginning of this most sacred event on this planet.. Amid chanting of Vedic hymns by all the Temple priests,the chief Temple priest, Sri. 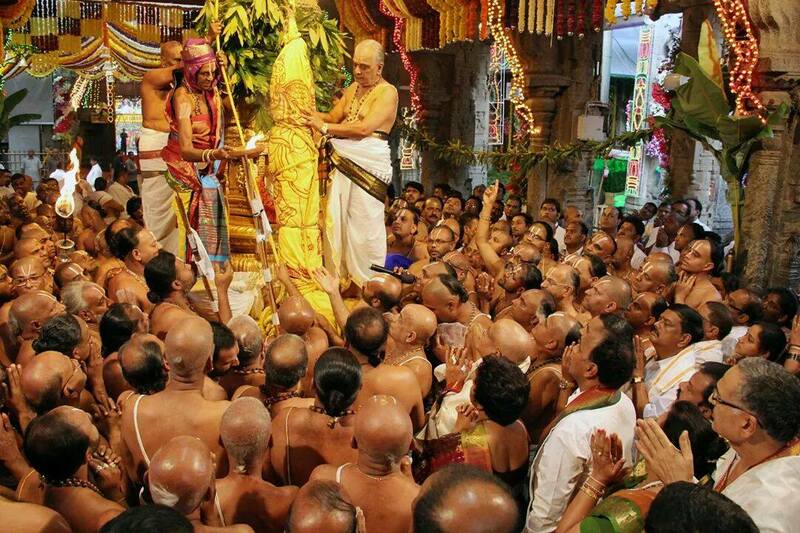 Ramana Deekshithulu, is seen here conducting the procedure of Dhwajarohanam,on the first day,to the Dhwaja Sthambham (Flag Staff) that’s there in the Sanctum Sanctorum area of the main Tirumala Temple..
On the morning of the second day the Lord is seen here being taken out in a procession around the ‘Mada’ streets of Tirumala Temple in a Chariot called Chinna Sesha Vahanam.. Later in the evening the Lord was again taken out in a procession on Hamsa (Swan) as his Chariot..Hamsa or swan means ‘pure and it is believed that Hamsa has an extremely great intellectual capabilities and can separate good from bad. 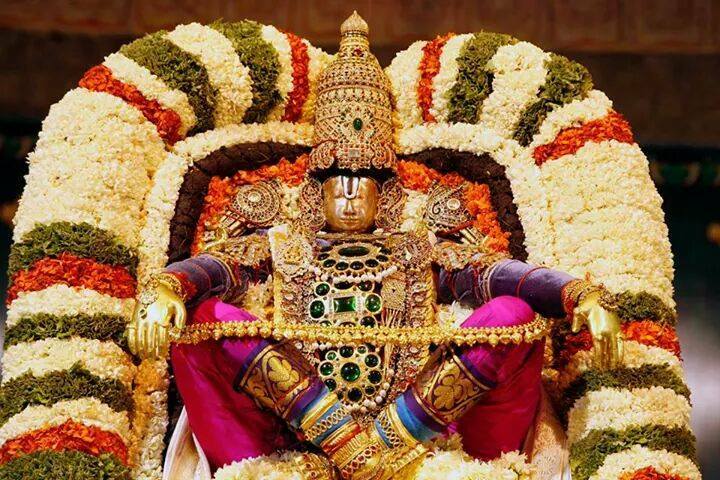 It is this glorious and this aristocratic our beloved Sri Varu looked when He was taken out in a majestic procession around the ‘Mada” streets of the holy Tirumala hill shrine – on His Simha Vahanam – as part of the annual Tirumala Brahmotsavams on the morning of the third day (28th of September, 2014) of the sacred event..
On the morning of the fourth day of the Brahmotsavams, as you may see here,the Lord was taken out in a procession on Kalpa Vriksha as His Chariot signifying that He is the giver of all boons to his devotees and fulfills all their wishes..On the evening the Lord was again taken out in a procession on a Chariot called the Sarva Bhoopala Vahanam signifying that He is the Lord of all Lords. 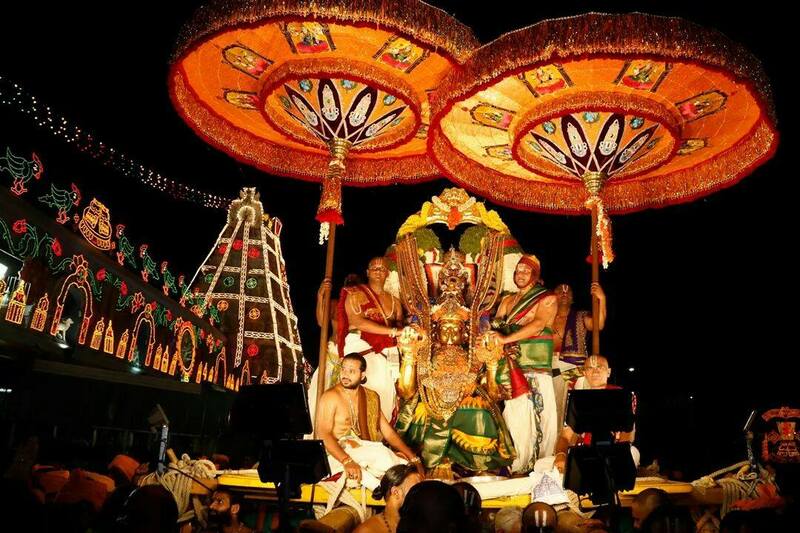 Hundreds of thousands of devotees from different parts of the world converged on the Tirumala hills on the fifth day of the Tirumala Brahmotsavams to witness the Garuda Seva, the most auspicious event of these Bramotsavams.. Heavy rains lashed the Tirumala hill shrine in the afternoon on the fifth day despite which all the hundreds of thousands of great devotees remained seated in the galleries chanting “..Govinda Govindaa..” loudly..
Sri Varu sported Mohini Avataram in the morning on the fifth day and in the evening – as seen in the photograph – was taken around the ‘Mada’ streets – on His favorite Garuda Vahanam in a grand procession much to the delight of these countless devotees who came from all parts of the world to Tirumala to watch this most amazing event..
Sri Varu is seen here on the evening of the sixth day being taken out in a procession on His Gaja Vahanam (A chariot with Elephant as it’s symbol).. As part of the rituals the procession pauses for a few minutes at important locations on the hill shrine to facilitate devotees have a close look at their holy Lord.. A Temple priest is seen here showing ARATI to the devotees to offer their salutations to their Lord..
Lord Sri Venkateswara is seen here seated majestically on His Chandra Prabha Vahanam (The vehicle of Moon).. Later,He was taken out in a grand procession on the evening of the seventh day of Brahmotsavams,on this Chariot,around the fully crowded ‘Mada” streets of the Tirumala Temple..
On the morning of the penultimate day (eighth day),the Holy Lord Sri Venkateswara is seen here being taken out in a procession seated on a fully decorated Chariot called the Aswa Vahanam (symbol of Horse).. 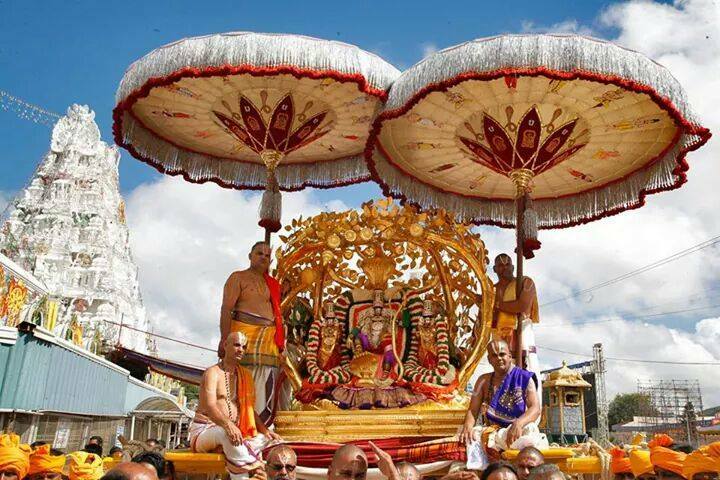 This ride of the Lord symbolizes that Lord Sri Venkateswara is also one form of Kalki Avatara. 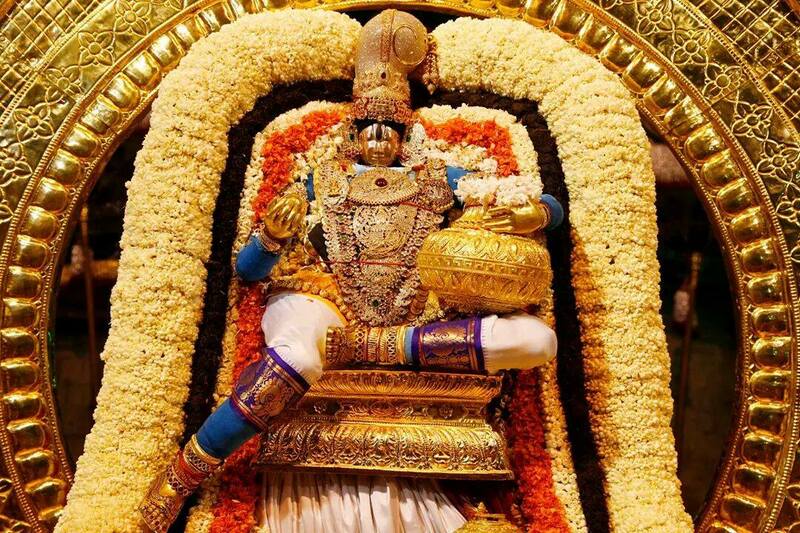 Very few people know and very few people follow but it was on an Ekadasi day after Vijaya Dasami that Lord Sri Venkateswara set His foot on this planet.. Lord Vemkateswar’s birth star is Sravana and hence on this day of Ekadasi with Sravana being the star on that day, “Sri Venkateswara Jayanthi” was celebrated on the Tirumala Temple on this day of 4th October,2014..
On the morning of the ninth day of the Brahmostavam, a special abhishekam (Avabhrutha Snanam) was held for the Utsava Moorthy (Processional Deity) of Lord Venkateswara and to His consorts Sri Devi and Bhoo Devi in the complex of Lord Varaha Swamy temple on the banks of Swamy Pushkarini..
You may see the Holy Lord here along with His consorts Sri Devi and Bhu Devi after He was offered those special prayers on this auspicious day. 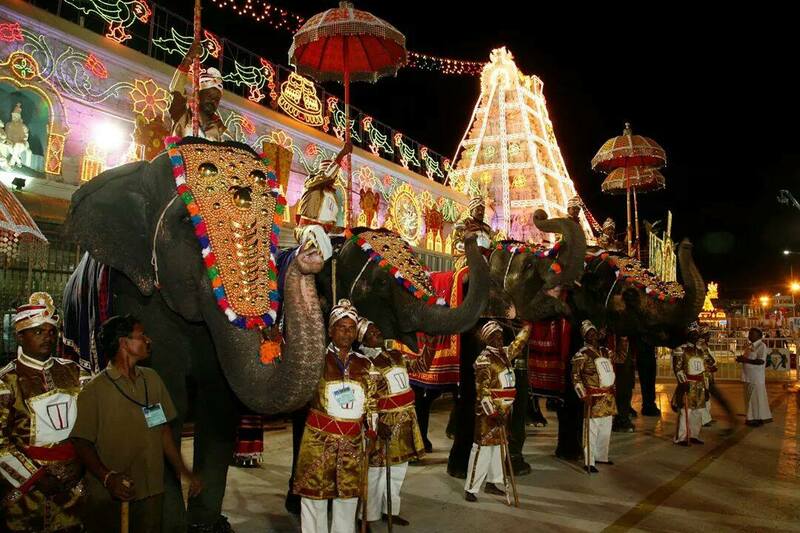 This photograph is perhaps the most amazing and the most special photograph of the entire event.. On the evening of the sixth day of the Brahmotsavams when Lord Sri Venkateswara was being taken out in a procession on His Gaja Vahanam (Chariot with Elephant as symbol),these holy Temple Elephants,much to the delight of all the devotees,have raised their trunks on their own in honor of the Holy Lord Sri Venkateswara and offered HIM their humble salutations..